I am the kind of person who thrives on lists and order. If I write something down, I’m twice as likely to get it done. If I declare I’m going to do something, I keep my word. The December Run Streak was a perfect challenge for me. It kept me running through a month full up highs and lows, Christmas craziness, travel, and rich, delectable food. Once I committed on Dec. 1, I felt compelled to follow through. An 11 p.m. run after baking shortbread. The challenge was simple: run a minimum of one mile (or 1.6 km) every day. Now that I have a treadmill it was next to impossible to miss a day. Now, believe me, there were days when I felt like I had absolutely no time to fit it in. With busy work days (especially at the beginning of the month), followed by caring for a sick/cranky/teething toddler who decided to stop sleeping through the night, followed by a five-day trip to Ontario, this challenge was tough. But aside from one missed day, my last day of work at the Telegraph-Journal, Dec. 11 (I just didn’t have it in me), I am proud to say I ran every day this month! I plan to cap it off with 10 km on Dec. 31. Christmas runfie in short sleeves. This is not the first time “streaking.” I did a similar challenge in 2013. At the time, I was in my first trimester of pregnancy and it helped me get through that general “blah” feeling those early weeks can bring. I didn’t have a treadmill at the time but I also didn’t have a baby. I will have surpassed my September mileage by the end of this month at 95 km – that’s more than when I was training for a half-marathon! Most days I only ran one or two miles. I tried to run 5 km at least a couple times a week. It doesn’t take long to add up. I forced myself to run even if it was late. I ran as late as 11:30 p.m. one night after visiting with a friend at my parents’ farm. I told her as she was leaving that I wouldn’t do my run. She coaxed me into it. The air was so mild and it was pitch black. It was so peaceful. I’m so glad I did it. There is something so fulfilling about capping off a stressful or awesome day with a brief jolt of running energy. I know I ate wayyy more calories than I burned this month, and I suspect I’m up a couple pounds. But this challenge made it at least a little more of a guilt-free holiday. What a great way to maintain a base of mileage before training for my next race. I totally recommend taking on a challenge like this. And it doesn’t have to be running. It can be walking, planks, burpees, eating veggies, drinking water. Make a goal and do it every day. It only takes 10 minutes, and every little bit counts. 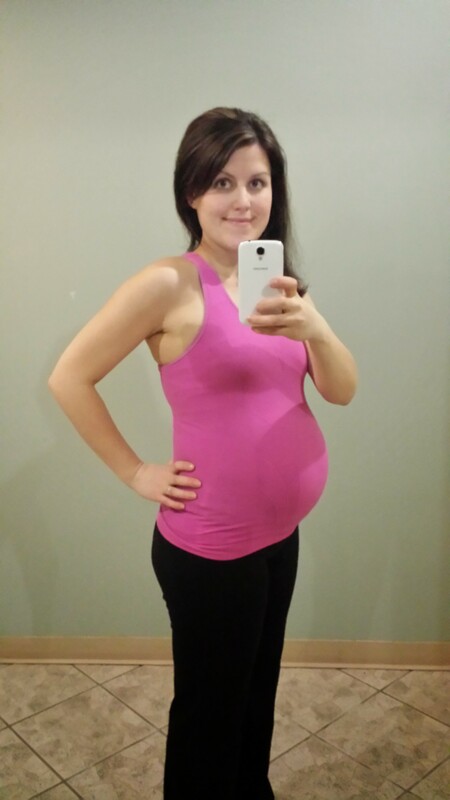 It was the second day into my third trimester when I realized my pregnant running days were drawing to a close. I had tried a brisk, 10-minute walk on the treadmill (on an incline) followed by a five-minute run at 5.7 mph. Repeated this twice to make a 30 minute workout. It was not exactly comfortable, but bearable. But boy, did I ever feel it when I got home. My mid section was killing me. My hips and lower abdomen were tight and sore. The feeling lasted a couple days. I always said I would keep running as long as I could through this pregnancy. And I guess just because it’s pretty uncomfortable to run now doesn’t mean I can’t. But I’ve decided to take a cue from my body (and my baby) and slow it down a notch. Time to turn those runs into walks. The last thing I want is to end up with an injury, or worse, to take a tumble that could hurt the baby. 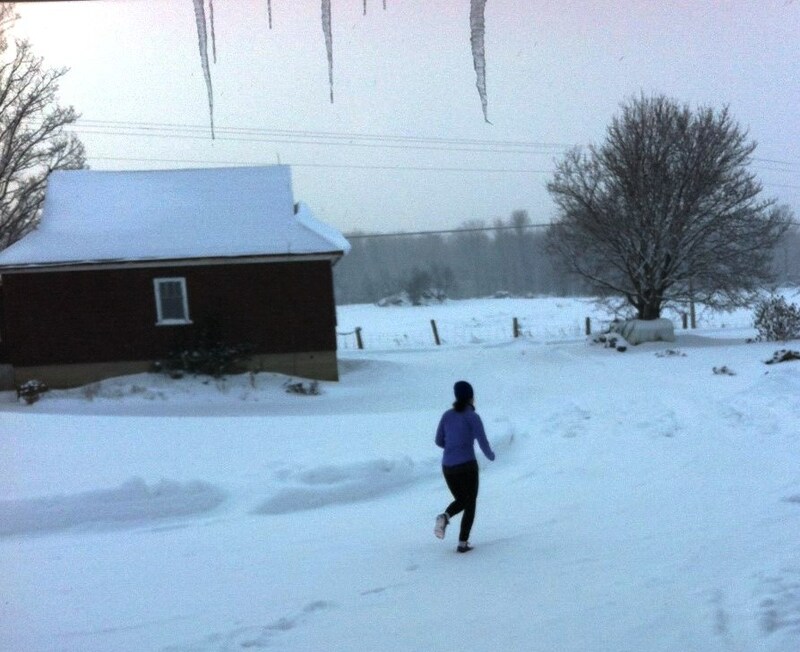 But oh… how jealous I am of my friends who are feeling the joys of spring’s first lovely runs. 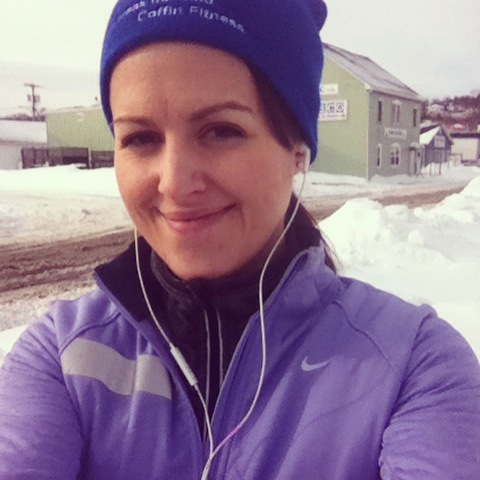 I think about last year at this time, and how I was knee-deep in half-marathon training. I was in tip-top shape, and now I’m waddling around, breathless half the time. I know that just because I’ve chosen not to run doesn’t mean I can’t stay in decent shape. I can still hit the elliptical, stair climber or bikes, and I can take spinning classes no problem. I have also thought about dropping in to the Aquatic Centre for some swims. And there are walks in the fresh air through the neighbourhood. Tonight’s walk was a pleasant, 40-minute jaunt. After a brutal winter, it was so nice outside, and there’s nothing like a good walk to clear the mind. I can use this time to listen to some informative podcasts, I thought to myself tonight. (Not like running, which for me, demands spicy dance and/or pop music). In my last 10 weeks of pregnancy, I hope to walk most days. The same group who joined me on a run streak last December have restarted the plan to coincide with the NHL playoffs, which should end just a couple weeks before my due date. I’ve decided to make mine a walk streak. But going from running to walking is a little like taking the caffeine out of your coffee. Like taking the sugar out of your cookie. It’s just not the same. Since joining the #RWRunStreak late on Dec. 4, I’ve managed to run almost every day, missing two. I can’t believe it. Yes, the runs are short, but it’s the effort of getting out there that really counts in this challenge. Bad weather is not an excuse. This month has been filled with storm after storm and it really doesn’t matter, there is always a way you can run at least one mile (or 1.6 km, or about 10 minutes), whether it’s outside or on the treadmill. Also, I have surprised myself by running in very frigid temperatures (I think -12 C was the coldest, colder with the wind chill) with my simple running gear. Which brings me to my next point. You only need one running outfit. I have run in my single pair of running tights for almost every outdoor run. Full disclosure, I have gone more than a week without washing them. Sometimes, like today, I have resorted to yoga pants, but they kick up a lot of slush and gunk. I have worn my trusty Nike Elements jacket, Lululemon Run Swiftly long sleeve shirt and if it’s really cold, another layer. I wear my bright blue Alex Coffin toque and slip my hands in the build in gloves in my shirts. That’s really all you need! Nothing fancy here! However, I have realized that if I knew I would be tackling longer distances in these conditions, I would want to invest in some sort of face mask for really cold runs, and some warmer tights. Also, maybe some Yak Trax. There is always a way to fit in a one-mile run. One day, in the photo above, I ran about 2 km to the post office during my lunch break to mail some Christmas cards. Another day, dreading a late night run after a long day of work, I ran from work to the bus stop in my street clothes (and parka! ), then got off the bus early and ran the rest of the way home. One day when I was traveling immediately after work, I woke up a dreaded 1/2 hour earlier than usual and ran in the dark before going to the office. I felt horrible and groggy at first, but by the time I was done, I was ready to take on the day. Running with friends is always better. Most of my runs for this challenge have been solo, as is the nature of this hectic time of year. But a few friends and I have set up a Facebook group to share our experiences and cheer each other on. It has been truly motivating. And it appears our group is going to keep active after the challenge! We are the Saint John Streakers if you want to join us. It really is possible to keep exercising through the hustle-bustle of Christmastime. I’ve pranced through knee-deep snow and tip-toed over ice. I’ve sweat over treadmills and snuck in a few spinning classes, since, heck, I was already at the gym anyway. I definitely did not lose weight this Christmas, and I didn’t up my mileage from previous levels, but I didn’t lose any fitness either, and that’s pretty cool. You might even call it a Christmas miracle. It’s Christmas Eve and the #RWRunStreak is still on. I’m home for the holidays and just wanted to drop a quick line that I have a near-perfect record since I committed to the streak! I’ve only missed two days because of travel and surprising my family. Got back at it yesterday with a magical 5 km at home and again this morning with 2.5 km. Merry Christmas and happy streaking to all those keeping up with the challenge! I’m late in the game, but I’ve committed to the #RWRunStreak – running at least one mile every day through the holidays. Yes, even if it’s a blizzard! Yesterday was Day 1 for me, and although I got home late from work, hungry and tired, there was no option to wimp out. I slipped on my running gear and ran 5 km. I came home a new person. Posted on December 5, 2013 December 5, 2013 Categories Run Streak, Running1 Comment on I’m streaking!